Thirty Rooms to Hide In, by Luke Longstreet Sullivan. 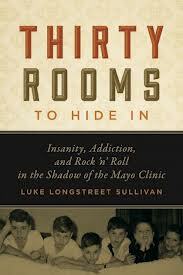 I just finished an amazing memoir, Thirty Rooms to Hide in: Insanity, Addiction, and Rock ‘n’ Roll in the Shadow of the Mayo Clinic by Luke Longstreet Sullivan (2012, University of Minnesota Press). You can read my full review on Goodreads. SPOILER ALERT (kind of): I’m not ruining anything for anyone who reads the first pages of the book. But if you are super picky about not finding out about any part of a story before you read a book, then you should probably not read the rest of this post. I have similar memories of seeing my dad in his casket. I was a little older than Longstreet Sullivan, but my dad’s wake and funeral were also held during a hot Minnesota July. I’m quite sure that anyone who has seen their parent(s) in a casket remembers their strong visceral reactions, but I haven’t read many descriptions. Have you?